Amid the chaos that surrounds the family, Perry wants answers and if she has to dig around Bartlett's head to do it she will. What we get is a fascinating backstory of how Bartlett came to be a vampire and his history with Grandpa. 'Redneck' #4 by Donny Cates, Lisandro Estherren, and Dee Cunniffe delivers a wealth of information that will keep you on the edge of your seat. Bartlett narrates this chapter as Cates develops his backstory with a clever twist. Perry, impatient and worried, jumps into to read his mind and interrupt his narration. They'll play off each well as Perry seeks answers and keep Bartlett focused on the facts. One of her goals is to find out what exactly lead to Slap's death. Bartlett's character has been portrayed as an outcast of the Bowman family and we learn why. It's not long that we find out he's not a blood relative but family in the fraternal sense as he's a vampire too. The trip down memory lane by poking around in Bartlett's head reveals a lot of things but not everything. Perry witnesses Bartlett’s cruel transformation to a vampire by some voracious settlers. Something that Bartlett doesn't take personal and understands now he was just "food" to them. The most disturbing information comes from their feud with the Landrys and Grandpa's part in it. The fact that Bartlett's personality wasn't the most confident didn't sit well with Grandpa and he took it out on him at times. Bartlett was a deserter of the Alamo and that only further demonstrates his tendency to fly instead of fight. But there's one thing he won't discuss and that's what Granpa did in retaliation for the Landry's attack on the Bowmans. Estherren's scratchy sullied line work works perfectly to tell this story that traverses time from dusty settlers to angry present day vampires locked in a family blood feud. The transitions from Bartlett's memories to modern day are clever with Perry as the pivot point. Perry is the reader's avatar in her questioning of Bartlett asking the things we want to know. Estherren makes those different scenes in cinematic ways with larger panels and Dee Cunniffe's colors differ subtly but enough to know when it's the past versus now. The pastels of the memories contrast well against the bolder hues of the present. 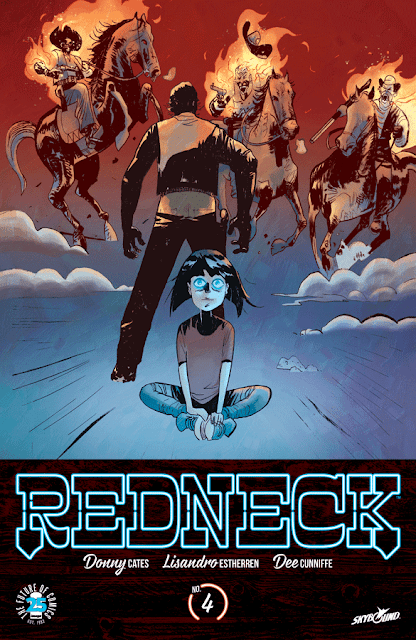 'Redneck' is one of the best reads in comics because Cates has taken a different approach in telling this vampire story that really is about family and conflicts. This issue is an exposition goldmine that is cleverly executed while remaining exciting and riveting. Issues three and four are usually pivotal for any new series and 'Redneck' has nailed the landing. You can usually decide by issue four if a book is worth continuing and Cates, Estherren, and Cunniffe have made 'Redneck' a must-read.